Who is involved: The Institute of Palliative Care and Organisational Ethics at Universität Klagenfurt, Wien Graz. 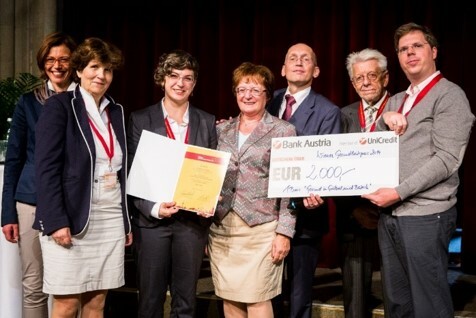 A steering committee consisting of Alzheimer Austria, the Austrian Chamber of Pharmacists and researchers from the Institute for Palliative Care and Organisational Ethics manages this project. It is funded by Fonds Gesundes Österreich, Gesundheit Österreich GmbH, Wiener Gesundheitsförderung WIG, Niederösterreichischer Gesundheits und Sozialfonds NÖGUS, and financially supported by Österreichische Apothekerkammer ÖAK. The project received a special nomination by EFID in 2014. Nature of activity: The project aims at promoting health and wellbeing for families, informal caregivers and people living with dementia via fostering the implementation of needs-based, person-centred care in community pharmacies, thereby developing a health-promoting community pharmacy environment. People living with dementia and their caregivers are regular users of community pharmacy services, which are an easily accessible health care setting within the wider community. The project is based on principles of health promotion and palliative care and offers specific opportunities for health-promoting interventions. Active participation and empowerment of people are basic principles in such an approach, thus fostering dignity and quality of life and reducing stigma. It fosters person-centred care in pharmacies via participatory health research. Applying the principles of participatory research (i.e. involving caregivers and people with dementia) is one major goal as is working in cooperation with Alzheimer Austria, (a self-help group), the Austrian Chamber of Pharmacists, and with other partners from palliative care and health promotion in Vienna and Lower Austria. Forty staff from 18 community pharmacies were consulted and took part in a series of workshops to further develop their knowledge in dementia care. Subsequently, via ‘practice-based projects’ developed by community pharmacies, interventions in the community setting were tested. Successful interventions encompassed issues around pharmaceutical care and building networks of care, spreading information on dementia via lectures and in designated counselling spaces in pharmacies, and organising and participating in community-wide activities such as ‘dementia-days’. The pharmacies were thus adapted to be welcoming and inclusive of people with dementia via delivery of specific interventions. Those staff who took part in the project improved their competence in counselling.